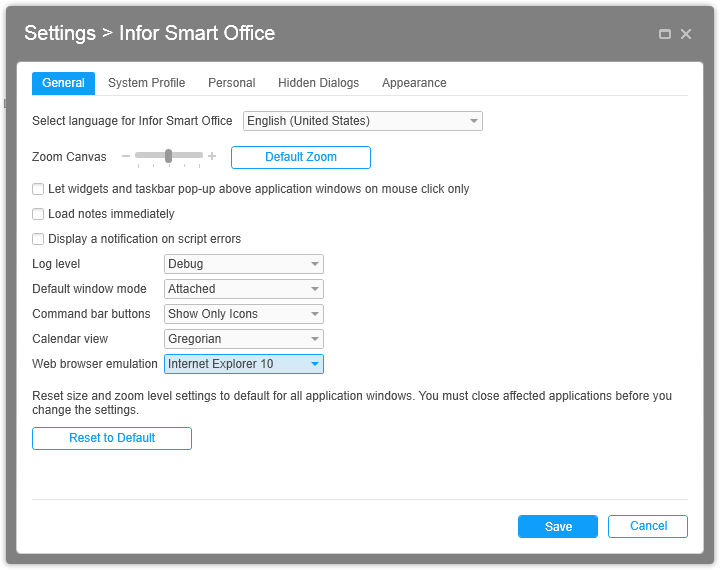 We have released Smart Office 10.1.2. It comes with some great new features. We have the Infor Ming.le web enablement in Smart Office. 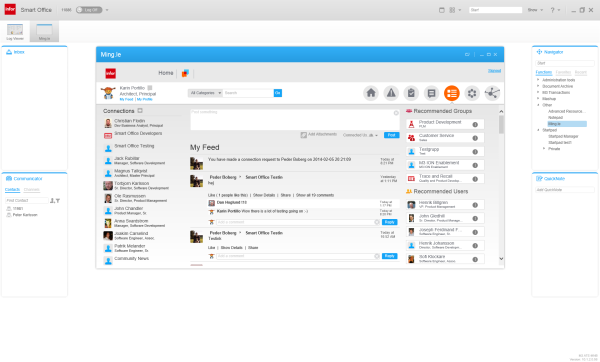 With this feature, it is possible to launch Ming.le standalone in the web browser control. A user can now open and work with the different Ming.le views and functionalities. Applications and specific records in Smart Office will be opened via the drillback links. Download and install the feature from the Download center. It’s a *.lawsonapp like for example the StartPad. 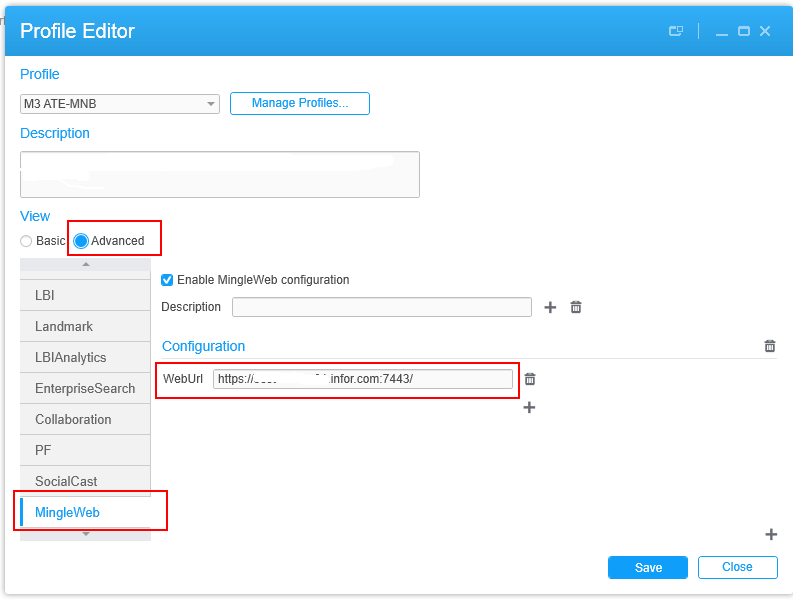 Switch to the advanced view and enter the URL to the Mingle social application in the WebURL field. Note that this is NOT the same as the URL to the entire Ming.le site with all the apps, just the social part of Ming.le. You need to go to Ming.le open the Administration page and copy the URL from the Infor Ming.le external URL. A new user setting has been added for Internet explorer web browser control emulation mode. The default value is currently blank which means no emulation mode is set unless changed by an administrator or user. When Smart Office uses the Microsoft browser control it uses IE7 mode by default and this works fine for older web applications but not so well for modern applications. The browser control can be configured by setting some registry keys but it is only possible to set one emulation mode. It is not possible to set different modes for different applications. In Smart Office 10.1.2 we introduce a setting to control what we set in the resgistry but of previous versions of Smart Office you can use the registry as a work-around. There is a new control called FormPanel. Using that control Mashups can now retrieve custom element values as well as standard field values. The form can now be personalized to have a hidden textbox or label and the result of some script action such as data lookup can be stored as the value of the custom element. Added ProgramOpened event for the M3 Mashup ListPanel. It is now possible to mark web links to be opened as external links in your default browser instead of only using the internal browser. 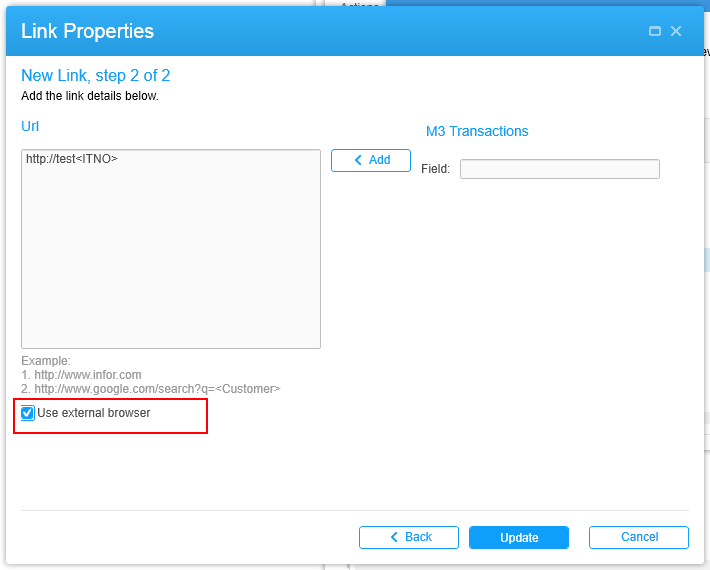 When you create a document link a checkbox will be available if a web link is recognized as a web link. Please note that the checkbox will not be visible for other links. Functional search has been enhanced to utilize keywords for user-related information in the search string. This is useful in using stored search strings like links, canvas shortcuts, etc. Instead of entering the userid in the string directly you can use a replacement variable that will be replaced with the current user. All values that are part to the M3 user context can be used as substitution variables in functional and global search for M3. The syntax used for this is the same as used for key search. Hotkey Files have been added to the Other tab of the Lawson Personalization Manager to allow administrators to view, delete, and copy user hotkey files. A new user setting, “Deselect list items on successful action”, has been added to the Advanced tab and will default to true to mimic the current behavior. Unchecking this option will allow selected items to remain selected on list driven forms and Jobs lists. New hot key added: Crtrl+F12 for submitting a job. This hotkey applies to standard Submit action or Quick Submit action, depending on the user’s toolbar button setting. A new personalization setting, “Allow Administrator personalization only”, is added to the Form Properties dialog to lock down form views from personalization by users. It is now possible to tab through the toolbox shortcuts and set focus appropriately via Show/Hide hotkey (Ctrl+Shift+F7). Table name has been added to the field information of List Driven forms and standard forms. On any standard form, set focus to any field and press the Field Info hotkey (Ctrl+Shift+O) and the table name is listed under the data name. The F8 form transfer feature, previously available on standard forms, is now available for all the list windows, including list driven forms and Jobs and Reports list. The feature is also enhanced to allow users to open a Drill Select window to find the token desired or to select from a drop down through all other Lawson Smart Office applications. A Find option has been added to the Report Viewer allowing one to search for the specified text in the report content. A new user setting is available – default report find option, which is either search loaded content or load content as necessary to continue search. The default option can be overridden in the report viewer with each search request. An Insert button has been added to the Job Wizard list. It is now possible to define a custom sort order for all of the Lawson list views via Custom Sort in Actions menu item. A new Lawson Data Area Widget has been added to the Widget Library. This function can display the current Lawson Product Line or Data Area. New IForm method: MoveDetailControl: Moves detail areas. This entry was posted in Tips and tagged 10.1.2, Ming.le, Smart Office on February 20, 2014 by Karin Portillo.